I was never considered academic at school. The fact that I came out of Grammar School with any results at all is still a mystery to me (and probably my teachers too!). I remember my French teacher saying that I spent most of my time looking out of the window drawing butterflies. I don’t think I was his most favourite (or attentive) pupil. I do remember looking out of the window (now and then), but I must admit to doodling during lectures. I am not sure if the subject matter was always butterflies (or any other insect for that matter), but I do remember doing lots of squiggly, whirly shapes, which I shaded in a cross-hatching fashion. 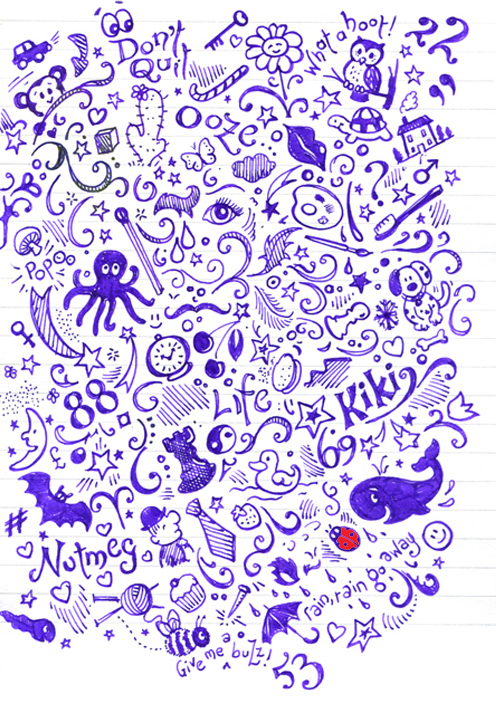 The subject of doodles has somewhat been a fascination to me and I wonder what psychologists would make of my doodles*… Perhaps there is a lot to tell from the way that we scribble in the corners of our notepads. Writing that last sentence filled me with certain sadness, in the fact that doodles are probably a dying art. How many people actually have a paper notepad anymore? Nowadays most people use computers or personal mobiles to record information. Do these allow one to doodle? Being an old-fashioned pen-and-paper chap I still love the art of doodling, when time allows of course. Despite my lack of good examination results at school, I redeemed myself in later life… When I worked at the local college, I re-studied a lot of my essential subjects and with the help (and patience) of two fantastic teachers, namely Mr S. Lane and Mrs C. Johnson, I passed my examinations in English and Mathematics. Passing my Maths exam was one of the greatest accomplishments of my life, as I am so bad at that subject. Admittedly, I gained a much better grade in English (an A*), but it was my Maths that gave me the greatest pride in my achievements. I am sure that my senior school teachers would have been proud (and flabbergasted) too. *On second thoughts, I would not really like to know what psychologists would derive from my doodles. I have a sneaky feeling that the results would be all too depressing! Doodle. Noun: A figure, design or scribble drawn or written absentmindedly.